Recycling is most commonly recognised as an environmentally responsible practice, built as an ethical response to a consumer economy. And while it is just that, it should also be recognised as an entrepreneurial endeavour. The act of converting wasted or used materials into new, reusable ones — at its core — is built upon the idea of recapturing value. For the purpose of this article, recycling will refer to the process of buying material goods as an investment. An investment will be defined as a purposeful allocation of money with the expectation of future benefit. The goal of the future benefit is capital appreciation, or at minimum, hold its value at a low depreciation rate. This benefit is often referred to as the return on investment (ROI). First and foremost, an understanding of what to buy is a defining skill in successful recycling. Investment decisions of any sort, should be well-informed decisions. This means doing everything in your power to understand the product, it’s history, and its relation to the market, prior getting any skin in the game. Due diligence shown minimises margin of error later. Why does a pair of Off-White Air Jordan 1’s sell for 1000%+ above MSRP (Manufacturer Suggested Retail Price — also known as “sticker” price), while a pair of Adidas Superstars can barely fetch half its retail value? If the utility of each shoe is the same, rather both shoes function as a shoe should, where does the difference lie? The seemingly impractical disparity in value comes in part from the idea of scarcity. Scarcity refers to the basic economic problem; the gap between limited resources, in this case material goods, and theoretically limitless wants (Investopedia definition). In the world of streetwear, scarcity lives in the form of limited edition products. Companies like Nike and Supreme have coddled this form of anxious consumerism through the popularisation of the “drop” model. Rather than having products be readily available throughout the season, companies are releasing rounds of products in a single instance. This machine is the foundation for “hype” culture, where the cost of entry is defined by the haves vs. the have nots. Knowing that there will be a limited supply, the demand (hype) swells for the few, popularised items. It’s important to understand that supply and demand are the key factors that will regulate pricing, particularly in the secondary market (post-purchase price). When demand exceeds supply — and it often does — prices will rise. The explosive demand for hype products in the mainstream has created new liquidity in the secondary market. An investment is much safer knowing that there is a pool of interested buyers, should you decide to sell. It’s not all about hype either. Scarcity has also taken form in items produced in past seasons that are no longer available on shelves. Websites like Grailed and TheRealReal have made it possible for menswear and womenswear enthusiasts to pinpoint garments from previous seasons that are no longer in production. These platforms have acted like market makers, providing spaces for buyers and sellers to connect with one another. Whatever products should you choose to invest in, understanding their relation to scarcity, and demand is key in predicting the longevity of their value. The process only works when a product is still useful, and there is no guarantee of positive returns. Blind consumption fails to pay respect to the time invested towards earning the money used in making a purchase. It’s important to remember that a purchase is an exchange, in which value should be transferred in both directions. All spending is not equal. Investing is spending with purpose; whether that be to preserve or appreciate. This knowledge can be leveraged as a guiding force when entering the market. By breaking down an asset (or product) into attributes, it becomes easier to understand where the quality and value are coming from. For the more hype items, value can be derived from the aforementioned cultural connotation of being in-crowd. For other goods, value can be a derivative of the quality of the materials used to produce a given garment. Whatever the value is anchored to, the end goal remains the same: invest to maintain and/or exceed the Principal. 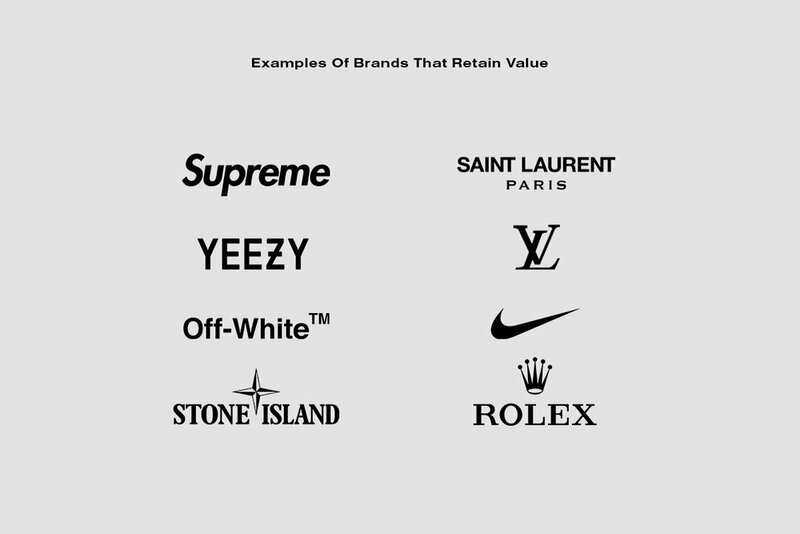 The difference between casually spending versus strategically investing in pieces can be illustrated through a comparison familiar to the Newspread audience; buying a Stone Island jacket versus buying a jacket from a major fast fashion retailer. Buying any top tier item from Stone Island is undoubtedly a considerable initial investment. The unicorn brand’s reputation sits on a culture of experimentation and innovation. Their objective is to push boundaries and create quality garments that redefine the common understanding of sportswear. Behind each jacket lies decades of cumulative research and experimentation, from fibres and dyes, to textiles. The company’s signature Tela fabric was initially developed in the 1980’s, and has seen new iterations to improve repellency and stand up to the test of time. In order to ensure quality standards are met, products of this caliber are often produced in low numbers, resulting in a higher initial price point. Fast fashion retailers look at quality and value differently. The value of fast fashion comes from accessibility through price point and abundance. Their objective is to provide a range of reasonably priced items for the marketplace at any given time. Trends are chased and saturated in a cyclical manner, designed to occupy and satiate short term desires. To achieve this, they often use cheaper materials, resulting in garments that fill the void in the meantime but may not hold their weight in value and construction long term. This is not a judgment of anyone who participates in fast fashion, rather a disclaimer that mass produced items are typically a depreciation asset in your investment portfolio. Calculating the price per wear (PPW) is another way of analysing prospective value. Say the initial investment of a Stone Island jacket is $600. Paired with materials that withstand multiple conditions (dual utility), a construction quality that promises longevity, and a preservation of market value at the end of its tenure in your closet, the long term value quickly becomes more apparent. This compared to a fast fashion jacket with a retail price of $100. Likely made from poor materials, often being more aesthetic than useful, low-quality construction meant only last a single season, and little to zero market value, the $100 expenditure begins to look less rational. Poor spending is like burning money; it’s irrational. Investing in garments of quality construction, from companies with considerable brand equity, means you’re preserving or ideally, adding value on your principal investment. After carefully considering the why, it’s time to explore the benefits of strategic buying. Whether we choose to acknowledge it or not, we all operate on some form of the hedonic treadmill, meaning the endorphin release from those new pickups will eventually fade. Should the items you purchase lose their luster and no longer spark the Kondo-esque joy they once promised, you can rest assured that you’ve hedged your investment. In the case of material goods, investing more can mean spending less. 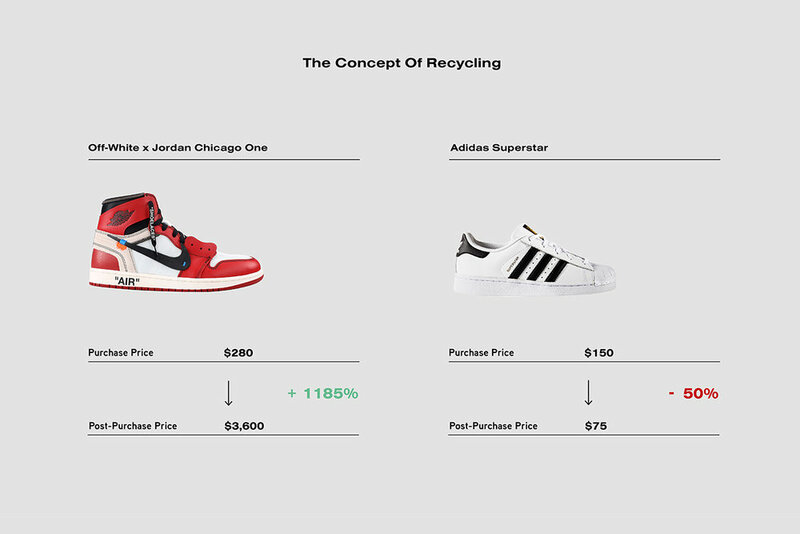 When done right, recycling clothing means recycling funds. After a certain threshold has been surpassed, the ability to recapture and regenerate value allows your primary income to remain untouched. No more breaking the bank to fund your sneaker addiction. Buying the sacai Nike’s you’ve been lusting after with a pair of Balenciaga’s that never fit you is a glorious victory. Returning to the initial example of resell culture, many entrepreneurs credit their start out of a need to fund their own habit. By buying two or more pairs of a given sneaker, they can rely on the secondary market to cover the cost of their initial investment, and save their hard earned money for the next rainy day. Whether your intent is to curate a better closet or create a supplementary income through reselling, this practice is designed to help you become a more informed and careful consumer. Pay respect to the effort invested in earning your income, down to the dollar. By focusing on material goods with real value, you’ll transform your closet into a well-organized space, filled only with things that matter to you. As they say, quality over quantity. What Does It Mean Long Term? The brief lessons detailed in this article, while focused on clothing, can and should be applied to other aspects of everyday life. In the grand scheme of things, clothing investing is relatively moderate risk, low consequence. Remember, no investment is guaranteed to succeed. Losing your entire investment is painful, sure, but the value of a single garment can usually be made back. Take advantage of this low consequence period to try, fail, iterate, and try again. The more you practice, the better you will understand how the market works and how to best situate yourself for success. Consider clothing recycling as the practice rounds. In the long run, you’ll eventually graduate to the more substantial milestone investments that require deeper consideration and analysis. Whether it be a Rolex (please buy vintage), a car, or even a home, the proportion of these investments means they are much higher consequence, should ill-informed decision making occur. To recap: start to look at your purchases through a more critical lens and ask yourself, if I buy this item what value does it provide me in the future, will I actually wear/use the item, and if I ever did want to sell this, what kind of return will I get on my investment? These questions will help guide you to make smarter choices in your everyday life, to think long term, and maximise the value and satisfaction from the material goods around you. Like this article? Please leave a comment below and tell us what you think and also let us know what’d you like to see us cover next in our Stories series.